Welcome to our 3-minute guide to Potteron boiler problems. In our quick guide, we’ll cover some common faults, what they mean, and what you’ll need to do next to fix the problem. Before we start, you can get quotes from Potterton boiler engineers to help fix your problem here. You can get a price for a new one in less than 2-minutes here. That’s a company part owned by Bosch, so they supply Worcester boilers DIRT cheap (finance, and installations from £1,795). This is a common problem with all boiler brands, not just Potterton. When a boiler pressure is too low, it will lockout. Essentially, the boiler will stop working and display a fault code. In this case, it’s likely that the E119 error will be displayed on Promax, Profile, Suprima, system and store boilers. If you’ve got a Potterton Gold or Titanium, the error code showing should be E118. Any leak in your central heating system, will cause your boiler to lose pressure. Resetting a boiler won’t fix the problem. The system will continue to leak and once pressure is below 0.6 bar, the boiler won’t restart, even after a reset. Topping up the system pressure can clear the fault code, but it doesn’t solve the problem; a leak that could be causing water damage. The leak needs to be found and fixed. Sometimes this can be a small repair (re-soldering a copper joint) and sometimes parts need replacing (such as boiler pump seals). Read our guide to boiler’s that lose pressure. When you turn on your boiler you’ll notice a small whirring noise that goes on for 2-5 seconds, before the boiler fires up. This is the boiler fan. The fan in your Potterton creates a draught that allows harmful flue gases to escape. The boiler needs to recognise the fan is operational before starting up. The circuit board gets this signal from an air pressure switch. This measures internal air pressure to determine if the fan is working, and if there’s a fault. As this can be caused by a whole host of problems, the boiler might display the wrong or misleading fault codes. It could display the E131, E151 or E152 as these are flue and PCB fault codes. It can also cause an ignition fault (code E133). However, it’s much more likely to display the E160 and E161 fault codes. These are fan specific fault codes for Potterton boilers. What Causes A Fan Fault? A broken PCB – it’s not giving or receiving the correct signals from the PCB and fan. The boiler’s casing needs to be removed. And, that’s a job for a Gas Safe engineer. Sometimes, repairing the wiring can fix the issue. In other cases, replacement parts will be needed. If the cost of repair exceeds £500, we’d suggest getting prices for a new boiler; a long warranty means you won’t be paying for repairs. You can get prices using this online form (takes less than 2 minutes and prices are displayed on screen). Another common fault with Potterton boilers, is a unit that heats up radiators, but cuts off before they’re up to temperature. If this is the case with your Potterton boiler, there’s a good chance there’s a E20 or E28 fault code being displayed. This relates to the sensors that monitor the temperature of water. Once up to temperature, they’ll send a signal back to the boiler to say that the temperature is optimal, and to cut off the gas supply until water temperature drops. If these sensors are faulty, they’ll be providing the wrong signals, potentially cutting off the gas supply before water temperature is optimal. What Causes The Boiler To Cycle Off? NTC thermistors are the temperature sensors. If they are faulty, they’ll provide incorrect readings to the PCB. However, on occasion, it’s actually the PCB that’s at fault. Then there’s limescale. When limescale attaches itself to pipes and components, it burns hotter than other sections of the heating system. So, if limescale has managed to attach itself near by the NTC thermistor, this will burn hotter than the rest of the water. The NTC thermistor then assumes (incorrectly) that the rest of the water in the heating system is up to temperature, and cuts off the gas supply. Get a Gas Safe engineer to check the NTC thermistor. If it seems operational, there’s a good chance that removing limescale will fix the problem. This can be done by completing a hot flush using chemicals. If the limescale has built-up over years, sections of the pipework that contain the NTC thermistor may have to be removed and replaced. A cold return pipe isn’t just a problem with Potterton boilers; but all boilers. When a boiler ignites, it will take a while for the return pipe to heat up. Hot water comes out of the flow (so this pipe warms up within minutes). After travelling around your heating system (where water will lose heat) it comes back into the boiler via the return pipe. So, there will be a differential in temperature, but not a huge one. 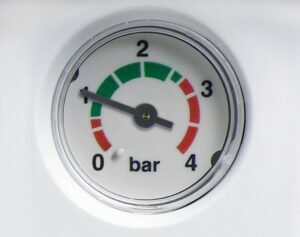 A boiler will display a fault code such as the E125 and E193 and then lockout. What Causes A Cold Return Pipe? Cold return pipes represent a circulation fault of some kind. This could be anything from blown seals, to the wrong pump, or even an incorrect speed setting. For a full list of heating pump faults, click here. Most likely, you’ll have a blockage from central heating sludge. A typical sign of this is radiators that are hot at the top but cold at the bottom. Sludge has made it’s way into the heating system, not been removed, and has settled at the bottom of radiators. A Gas Safe engineer will need to remove the casing on your Potterton, and assess the condition of the pump. Blown seals are easy to recognise, given the pump will be leaking if this is the case. They’ll check the pump is operational, and its speed setting. If this doesn’t fix the problem, it’s likely they’ll need to hot flush your system will chemicals to remove any heating sludge. With older Potterton Promax, Suprima and Profile boilers, we get lots of people asking why they have no hot water, even when the heating works. On the flip side, a similar problem can occur, but customers have heating but not hot water. What Causes A Boiler Not To Provide Hot Water? The problem isn’t limited to, but is usually associated with a diverter valve that’s stuck. A diverter valve essentially directs hot water to taps and showers, or your radiators. On a combi, if it’s broken or stuck, it will only provide one or the other. However, if the valve is partially stuck, you might get radiators heating up slightly, every time you turn on hot taps, or run a bath. Basically, hot water that is meant to be directed to your bath, shower or taps, is leaking through the diverter valve. This isn’t the only problem that can cause your Potterton boiler to provide no hot water. So, it’s worth getting a qualified local engineer in to help. They’ll assess the diverter valve, and there’s a good chance it’s worth replacing, rather than wasting time trying to fit an old and faulty part. We’ve wrote more on faulty diverter valves here. Thanks for reading our 3-minute guide to common Potterton boiler faults, symptoms and fixes. If you’ve got a problem with your Potteron boiler, you can get repair quotes from engineers here. 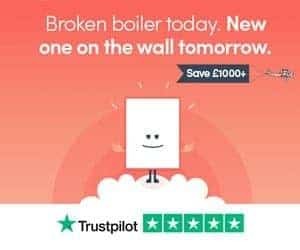 Set on getting your boiler replaced? Get a new boiler with up to 10-years warranty, fitted from £1,795 here. Still got a question? Leave a comment below and we’ll get back to you as soon as possible.